Crunching through the data in Twitter’s stream-of-consciousness and trying to get a handle on humanity’s inner thoughts is nothing desperately new. But for its World Cup coverage, The Guardian has applied this idea to a beautiful and fascinating active graph, charting all the reactions, predictions and – oh yes – petty rivalries generated by the world’s biggest sporting event. It displays, simply, a time-line of events and a series of hypnotically blooming, then bursting, tweet-thought bubbles that form according to the time-line’s position. As a peek into the football fan’s mind it is especially revealing – nefariousness, gloating, and banality are apparently at the forefront of the average football fan’s mind. So just before kick-off, the quivering bubbles show a populace rooting around the Internet’s murkier corners to find places to ‘watch’ the game ‘free’ ‘online’; though minutes later, thoughts have inevitably turned to celebrating Gerrard’s early strike – and griping over ITV HD’s monumental mistake of accidentally cutting to an advert just as it happened. Robert Green’s later, and equally vast, error causes the inflation of a huge bubble containing his name, possibly in sympathy, although – remember that this data is culled from the Internet, after all – the word ‘LOL’ appears in a slightly smaller one. 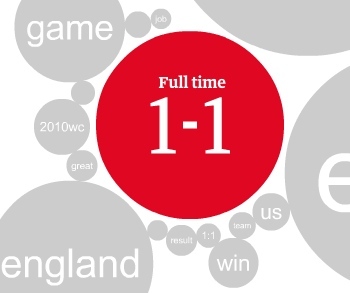 After the game, the consensus is one of a ‘good’ ‘result’ – with some Americans seeing it as a ‘win’. Watching the tweet-line back in ‘real’ time is a treat for anyone who wants a glimpse inside the minds of millions. The megalomaniac in all of us will glean ideas on how to further make friends and influence people. The rest of us can either scoff at the predictability of human nature, or take pride in our innate collective thinking. When applied to something as innocuous as football it’s interesting – but when applied to something really tasty, like a slow-burn political scandal or a huge, rapidly unfolding news event, it could make intriguing, and hugely revealing reading. 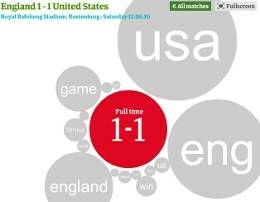 Simply as a spectacle, it’s a thing of minor beauty – the graph ebbs and flows like a football-specific Mandelbrot set. If the Guardian threw in a tie-die colour scheme and soundtracked it with some Jefferson Airplane, the World Cup could even find itself a whole new audience of disenfranchised hippies.